When I was at Prep School I had an especially cruel history teacher whose favourite subject was Offa’s Dyke. At the time I was only eight or nine and didn’t really understand who King Offa of Mercia was, or, for that matter, what a dyke was. He went on and on about the damn dyke and the even more damned Dark Ages when, he insisted, nothing happened in the world for hundreds of years… until King Arthur burned the cakes, or something like that. I’ll probably come to the myth of the Dark Ages sometime soon, because they’re one of the greatest fallacies that have been rammed down the throats of generations of knock-kneed schoolboys unfortunate enough to attend English Prep School. But let’s turn back to King Offa. He was the ruler of Mercia, a kingdom centred on the Valley of Trent in England, in the second half of the eighth century. A few thousand miles to the East, the Abbasid Caliph al-Mansur was in power, presiding over what has come to be known as the ‘Golden Age’ of Islam. One of the remarkable things about King Offa (to schoolboys at least) was how easy his name was to spell, when compared to everyone else who was around. He was preceded by King Beornred, married to QueenCynethryth, and followed by King Ecgfrith. 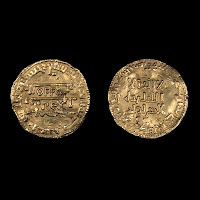 But even more amazing was that he struck a gold dinar in England which bore his name in Roman sc ript. Nothing strange about that perhaps. But on the reverse was an inscription in Arabic. It reads, ‘There is no God but Allah’. If you don’t believe me, here’s a picture of one of the coins which is held in the British Museum.